Well, but of course, you’ve done it again Carin! What a magnificent shot – all those horizontal and vertical lines taking us into the scene and back out to the viewer’s eye. Your choice of the bright pink streaks taking us to the trees is so effective. One of those happy surprises. The window was what caught my eye. The lines were the bits I ‘saw’ afterwards. That is remarkable. The black and white area has the feeling and creepiness of a woodcut, or rather an engraving. It makes me think of an illustration of an old-fashioned fairytale. And then that amazing pastel-striped oblong with just a hint of the distant tree-line. I have no idea how you did this, and am impressed and curious and jealous, but above all so pleased with the gift of this early morning visual surprise. 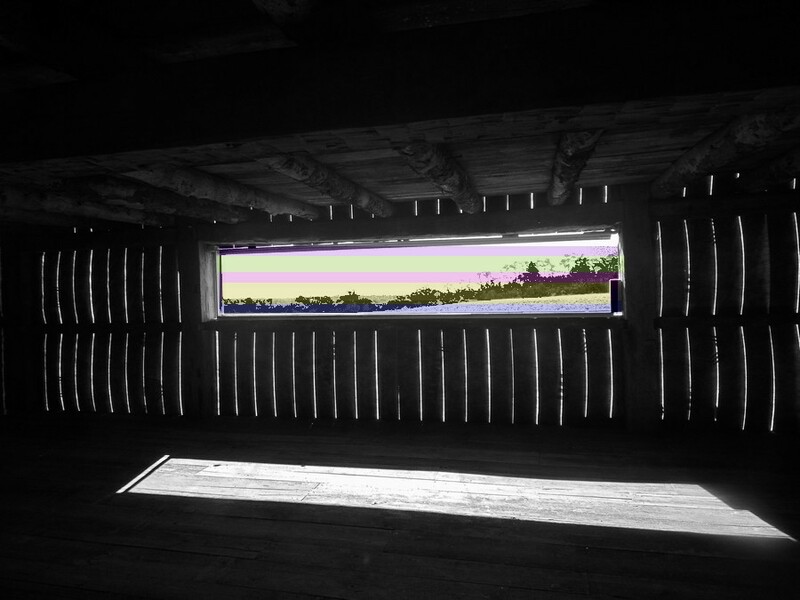 How beautifully you have ‘framed’ the landscape with this shot, Carin, from within an old barn perhaps. Black and white on the interior … sunrise pastels on the exterior … sunshining on the floorboards! Yes, those floor boards. An old barn, but in a winery. Can’t think which one. Wow, I love this shot, Carin. The mood is mysterious, almost otherworldly. The eye is drawn through the dark barn to the window, with that bright but also alien-looking landscape beyond. (How DO you do those crazy skies?) I like all the lines inside the barn: the ceiling beams, the vertical light coming between the wall boards, the floor boards, and best of all, the shape of the light cast on the floor, echoing the window. This one keeps the eye roving and finding new things: wonderful composition. Such exquisite use of colour, light and lines!